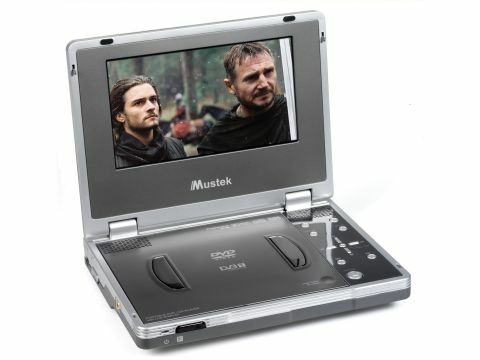 That might also go some way towards explaining why the DVT407 is a bit chunkier than your average portable DVD player too, since it has to incorporate what is a unique feature in this product category. Flip the lid open and you'll see the 7in screen and a small smattering of playback/menu controls. The battery unit is weighty and unsympathetically designed, spoiling the overall look and adding to the size when connected to the main unit. Rounding up the features briefly, progressive scan DVD and DVB-T footage is on the menu thanks to the shared S-video/component video socket, while you can also connect to other equipment via composite, audio and coaxial sockets. Further good news is that all these sockets can be inputs or outputs thanks to a sliding selector switch. An Electronic Programme Guide (EPG) is provided for Freeview broadcasts, along with a programmable favourites list, and the DVT407 claims support for both PAL/NTSC TV systems and teletext. Dolby Digital is supported as well. First under the microscope is TV via the Freeview tuner. The picture is OK once you get the antenna in the right place, although that can be difficult to achieve. If you don't get it right you'll either be greeted with lots of block noise or a 'no signal' message. Some colours - red and green in particular - can look a touch over-saturated and reds tend to stray occasionally. You can adjust the colour, but only on a seven-point scale, so you can't make subtle changes. You'll also notice some shimmering around the edges of figures as well. First-time channel tuning is performed via a set-up wizard, but it's quite easy to do yourself once you've found the right menu. The channel list and EPG are simple to use and easy to navigate, but we were unable to access interactive text channels such as BBCi or ITV Teletext. Switch over to DVD and things continue to be a bit hit and miss. Pictures are generally free of most types of noise, but show signs of struggle with fast motion in the shape of some slight smearing. Colours also go from being almost too vibrant to looking fl at and unnatural, and our DVD of Charlie and the Chocolate Factory caused the DTV407 real problems in this respect. Black levels didn't impress either, with pictures having a tendency to grey over and there was very little detail on show in the darker scenes of Corpse Bride. The DTV407 is not without its operational quirks either. Unless you have the antenna connected to the unit, it can be difficult to tell when you're in DVD or TV mode since you don't get any onscreen indicator of its status. Menus can also be tricky to find, and the main menu in TV mode is accessed via the setup button, not the menu one as you might logically expect. The instruction manual isn't much help in this respect either!